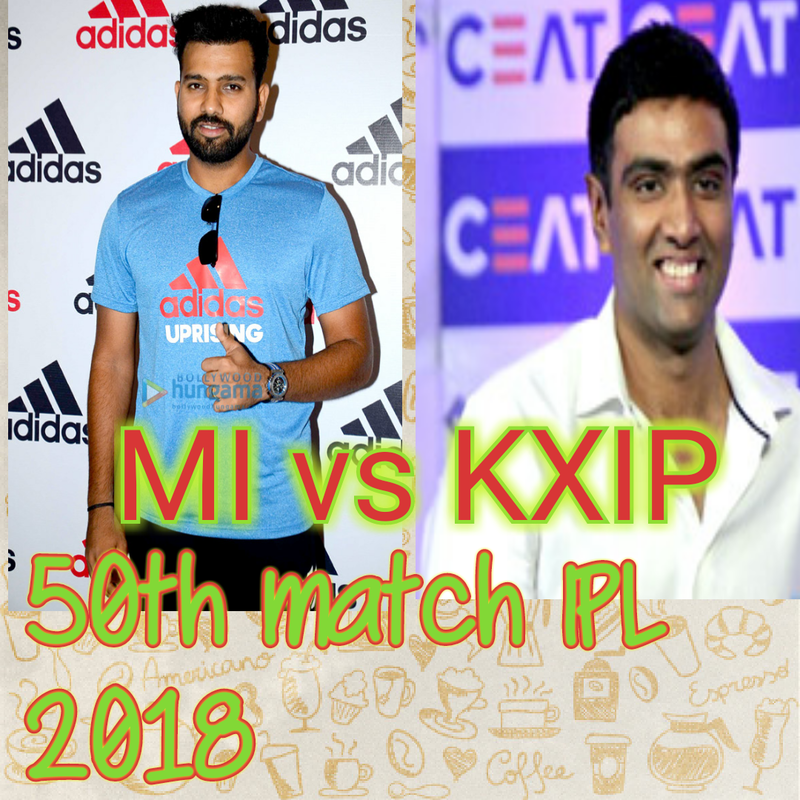 Mumbai Indians and Kings XI Panjab will meet together in the 50th match of IPL 2018 which will be played in Wankhede Stadium Mumbai. Mumbai Indians have played 12 matches in IPL 2018 in which they have lost 7 and won 5 matches. MI is now at the 6th position in point table with 10 points and good run rate in 12 matches. Mumbai Indians have won their first match against KXIP easily but today situation is different. This match will be a knock-out match for MI. So if MI loses this match they couldn't remain in the game. KXIP's journey in this IPL is full of uncertainty. They have won 5 out of previous 6 matches and lost 5 out of next 6 matches. A middle order of this team is suffering from a bad performance. The form of Chris Gyle is also in difficult. In the previous match against RCB whole team of KXIP all-out at 88 and lost that match by 10 wickets in only 8.1 overs. So match will be very interesting because both team fight to secure their position for playoffs. Even Lewis, Suryakumar Yadav, Rohit Sharma, Hardik Pandya, Krunal Pandya, JP Duminny, Ishan Kishan, Ben Cutting, Mitchell McClenaghan, Mayank Markandey, Jaspreet Bumrah . KL Rahul, Chris Gayle, Mayank Agrawal, Karun Nayee, Aaron Finch, Marcus Stonis, Acer Patel, R Ashwin, Andrew Tye, Mohit Sharma, Ankit Rajpoot. They have met 21 times in which Mumbai Indians won 11 and KXIP 10 but in Wankhede Stadium in 7 matches KXIP have won 4 and Mumbai Indians have won 3 matches. Kings XI Panjab won the toss and opt to bowl first. Mumbai Indians have done some changes Kiron Pollard is playing in place of JP Duminy. Even started the inning with Suryakumar Yadav. Andrew Tye did amazing bowling and got 3 most valuable wickets in the powerplay. Mumbai Indians scored 60 runs in the first powerplay of 6 overs for the loss of 3 wickets. After 10 overs score was 79 for the loss of 4 wickets. Rohit Sharma failed again to play a good inning. Suryakumar Yadav played a great inning and scored 27 in just of 15 delivery in which he smashed 3 4s and 2 sixes. Even Lewis 9 of 7 with 1 six and Ishan Kishan scored 21 of 12 delivery with 1 4s and 2 sixes. Andrew Tye got wickets of this 3 batsman in his 2 overs spell in which he gave only 5 runs. Rohit Sharma scored only 6 runs in 10 delivery. Ankit Rajpoot bold him caught by Yuvraj Singh. 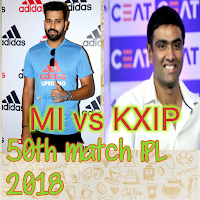 Krunal Pandya and Kiron Pollard still playing a great inning and scored 49 runs in 3 overs . over no 12 to 14. MI scored 134 in 14 overs. In 15th over Stonis got the wicket of Krunal Pandya who scored 32 of 23 delivery in which he smashed 1 4s and 2 sixes. Kiron Pollard is on fire got his fifty in just of 22 delivery in which he smashed 5 4s and 3 6s. Hardik Pandya came to play after losing Krunal Pandya's wicket. R Ashwin got the wicket of Kiron Pollard in 16th over. Polaris couldn't add any run in his fifty. MI scored 157/6 in 17 overs. Andrew Tye got 1 another wicket of Hardik Pandya. Ashwin got the wicket of Ben Cutting. Andrew Tye got 4 wickets in this match. No bowl in 19.3 over but couldn't get benefits because Mayank Markandey was on strike. KL Rahul and Chris Gayle have a good start but Gayle becomes fail. KL Rahul played great inning once again. He scored 94 of 60 delivery but couldn't achieve team to win. Jaspreet Bumrah got 3 most valuable wickets in death overs by giving only 17 runs in his 4 overs spell. Any batsman of KXIP couldn't smash even a single boundary in his spell. KXIP scored 183 in 20 overs and lost the match by 3 runs. Mumbai Indians won the match by 3 runs and got 4th position in point table with 12 points and good run rate.